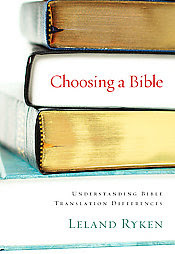 This is a short, excellent pamphlet on the differences between Bible translations by Leland Ryken that I encourage everyone to read. It is greatly worth reading for the short time it takes. Many blessings! Eli, great article. I have always felt a little ripped off with some of the d.e. translations. I agree and disagree. I have to say that I was not able to read through the Bible until I picked up NLT. Not that I was stupid, but just not interested in deciphering the Old School English, much like I hated reading Shakespeare. I think that it is more important that people (esp new believers) get a chance to read through the Bible a few times without having to be an English major. That being said, it must be made more clear to people that they are reading interpretations and not translations. As said, certainly no good for memorization, preaching, meditation, etc... People need to mature in their reading I think and keep digging, which will lead to the literal translations. I am firmly convinced the King James is the correct Word of God. I think the problem with the other translations, especially NLT, NIV, Message, and yes even NASB, ESV, NKJV, etc are that they are incorrect in many cases - and sometimes in major doctrinal areas. For ten years I floated from reading the NASB, the NKJV, the KJV, the Amplified, the CEV, the NLT, etc. and looking back I wish I had read the KJV from the start - reading all the different versions create much scatter in my mind, and greatly diminished my retention of verses. This is the Word of God and not man we are reading. Read slowly, and read as much as possible of the Bible and in little time the "difficulty of reading the King James" will be long gone. I am often struck by many who say they cannot understand it when, I know many who have much less than a "high school" education and it is clear as day to them. Many of the "scholars and theologians" of OUR day, discourage the reading of the Authorized King James yet many people I know are men and women and children who the world would consider "ignorant and uneducated" very simply read and understand God's Holy word in the King James. Someone once said, "I read the living bible.....the King James Version". Just for the record, Ryken is NOT promoting the King James Version but more literal translations as opposed to dynamic equivalent versions. I agree, Micah, and I don't have a problem with people reading the NIV or NLT, etc. As long as they understand that it is not a translation. My hope is that we as Christians would value the very words of God. It's important for us to understand the difference and to be serious about the purity of Scripture.